The right way to determine skin asthma is by recognizing the condition itself especially its symptoms. Why? Knowing the symptoms is the easiest way to identify the skin condition to determine the precautionary measures to adopt. Skin asthma has been around for ages and people who are suffering from this kind of medical condition thinks it is merely a simple allergic reaction. While it can be classified as an allergy, it can lead to exacerbated conditions leading to secondary infections. People with skin asthma (atopic dermatitis or eczema) are predisposed to developing respiratory asthma as well. 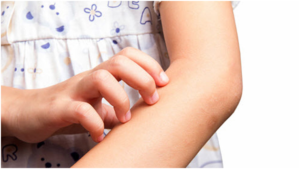 Intense Itch: The most revealing symptom of skin asthma is itch. Once the skin has been irritated by certain allergens or triggers, itch is followed by scratching. If scratching causes cuts and wounds, secondary infections may ensue. Dry Skin: People with skin asthma commonly manifest dry skin. This is the reason why it is important to keep the skin moisturized or hydrated. It is, however, important to note that there are moisturizers that can activate skin asthma instead of help it fight the allergic reaction. This makes it necessary to consult with a medical professional to get the proper guidance. Inflamed Red Skin: Another prominent symptom that will appear is an inflamed red skin; Inflamed red skin is commonly accompanied by scaly, and sometimes, rough leathery patches. This may even ooze with pus or blood. Recurring Rash: The dilemma of having skin asthma or eczema is keeping skin rash appear again and again, once it is irritated by the triggers. It is useful to note the suspected triggers each time there is a flare up of symptoms to narrow down and avoid the suspected culprits. Bleeding and Infection: Bleeding can be manifested once a person is continuously scratching the affected skin and most-likely infection will takes place especially if the hand used is dirty or contaminated. The best thing to do to avoid flare ups is to stay away from irritants suspected to be the triggers of skin asthma. Understanding the triggers that can cause flare-ups skin asthma is everything as it can help you elude those things that can activate skin asthma. It may not totally solve the problem, yet it is the first step. Since dust, pollen, and others are considered triggers, it’s best to keep the air quality in your home clean and free from allergens. Here is some more information about dehumidifiers that can help you understand how these can help you prevent symptoms of skin asthma from becoming aggravated. It is also important to avoid stress that can cause the activation of skin asthma and its symptoms. Relaxation techniques as well as exercise can help alleviate the symptoms and the right moisturizers can effectively hydrate the skin. Skin asthma can be irritating and even embarrassing. It is better to prevent it than to suffer from its itchy, even painful symptoms. The key is to know what triggers the flare ups to prevent skin asthma symptoms.